Location: 232 km east of Melbourne. This town lies on the Avon River, which was named by the GippsIand explorer Angus McMillan after a stream in Scotland where he had once lived. It is the site of the first permanent settlement In GippsIand and the gold rushes in Omeo and near Dargo helped its early fortunes. KNOB RESERVE - 3 km south-east of Stratford is a 56-hectare park called Knob Reserve, home to an annual country music festival. At the crest of the hill you can look down upon the local farmlands, the foothills and the Avon River. The reserve is ideal for a picnic and has the appropriate facilities. 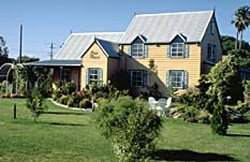 STRATHFIELDSAYE - was the homestead of squatter, William Odell Raymond, who established a run in the area in 1842. He built the house in 1848-54 from hand-made bricks and pitsawn timber. It is located on Bengeworden Road, a little north of the town, on a ridge which commands a pleasant view of Lake Wellington. Apart from some extensions in the 1870s it remains almost untouched, structurally along with its furnishings and some ancestral memorabilia. On 30 September 2003, Strathfieldsaye Estate Ltd (SEL) assumed custodianship of this historic Gippsland grazing property. SEL shares a common board of trustees with Australian Landscape Trust and ALT has responsibility for the operation of the Strathfieldsaye property. AUSTRALIAN WILDLIFE ART GALLERY AND SCUPTURE PARK - Past the Munro turn-off is the Australian Wildlife Art Gallery and Sculpture Park where you can see Australias wildlife faithfully depicted in paint, clay and bronze by award-winning artists, Chris and Dawn Stubbs. It is open to the public, Thursday to Monday or by appointment. CRYSTAL STUBBS has a studio at the Gallery and produces hot solid formed glas sculptures that are figuratively based. Crystal has been scholarship recipient at Pilchuck Glass School in Seattle where she studied under Dino Rosin. Crystal Exhibits her work at the Gallery and received a Monash University Fellowship in the glass studies area in 2003. THE BATALUK CULTURAL TRAIL - extends from Sale in the east, through Stratford, Mitchell River National Park, Bairnsdale, Metung, Lake Tyers, Buchan and Orbost to Cape Conran in the west. It follows the trails and trading routes of pre-colonial days and focuses on elements of Koorie history and culture, including Dreamtime stories, traditional lifestyles, the Den of Nargun, Legend Rock, Aboriginal Keeping Places, archaeological sites such as canoe trees and shell middens (some dating back 10 000 years), cultural centres of the region, and aspects of European invasion, colonial settlement and present-day existence. At Stratford the focus is on Knob Reserve.